Wan Saiful Jan: the duplicitous face of Mahathir’s agenda. The Malaysiakini headline title above, because it juxtaposes two political parties, one Malay and one Chinese, says much about Mahathir Mohamad’s ultimate intent in Harapan: there, he would recreate an Umno. Mahathir has himself said many times: Umno today is Najib’s Umno, not his. That is, Umno is not the Umno he would wish for it to be — Mahathir’s Umno. Najib’s biggest sin, in Mahathir’s eyes, isn’t therefore 1MDB which, by the standards of the man’s heydays and the losses incurred then, is paltry. The primordial sin is, Najib didn’t follow Mahathir’s script, a fact the latter had acknowledged many times early in his anti-Najib campaign, then without Harapan. Like the accusation made against Tunku Abdul Rahman 50, 60 years ago, Najib was simply pro-Chinese. Even in Harapan, Mahathir’s racism remains insufferable. His anti-Chinese fascism this time is the same and his excuse no different: the Chinese bogeyman tale that he himself had strung together then perfected. Wan Saiful (above image) is his new mouthpiece, so as to give an intellectual sheen to the deception. Saiful’s duplicity follows this logicism: If Umno says the Chinese in Harapan will rule Malays, then let Berjaya rule Harapan, so Malays will rule Malays. Ruling Harapan, Bersatu will win the Malay vote. Winning the Malay vote, Harapan gets Putrajaya. Here comes the rub: With the Malay vote in the pockets, what policy will therefore govern the future Malaysia? The fact that this racist thinking is already congealed inside Bersatu — and this is before voting has started — speaks volumes about the future of Malaysia under Bersatu and under Harapan. 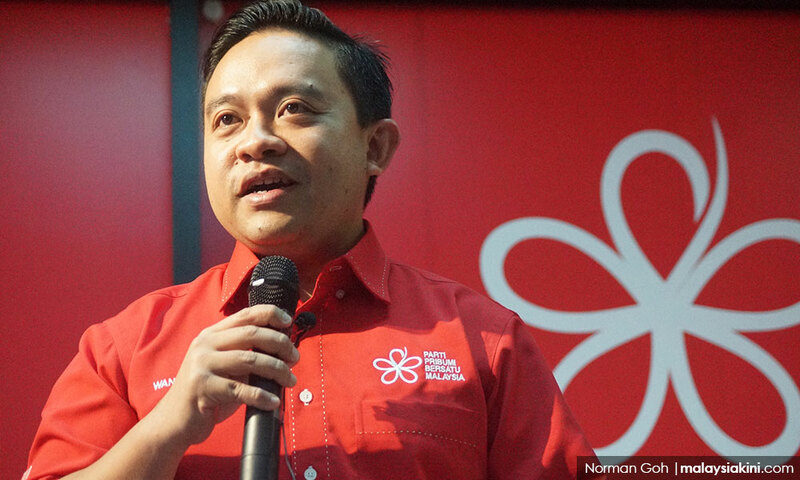 Now, contrasts Wan Saiful’s call for Bersatu dominance against the Harapan apologists who said of the coalition’s power structure: no party dominates, everyone has an equal say. It isn’t enough, hence, to deny Bersatu that pole position in Harapan or to balance it with the like of PKR and Amanah. It will be inevitable Bersatu becomes an Umno when Harapan seizes power; the more seats Mahathir gets, the more convincing is Harapan’s mirror reflection of the bogeyman tale. Harapan becomes the beasts it eschews, and Bersatu becomes Umno. The point, on the other hand, is not to let Harapan get Putrajaya because Harapan is Bersatu’s vehicle to a renewed fascist dictatorship. The point is to kill Harapan before it takes off, to drain the swamp filled with worms like Wan Saiful and Rais Hussin carrying out Mahathir’s agenda. All the talk of reforms and manifesto remains as they are: cream for the pudding. To see what party manifestos are worth, look at the Constitution, Malaysia’s own manifesto. Instead of offering protection, it was used by Mahathir to turn against the Chinese and other ethnic groups: although a mamak, Mahathir’s personal power as Malay; Islam as ‘official’ religion; schools; and so on. The Chinese, to save themselves from another, fresh round of fascism, to avoid repeating the political mistakes of the past, must return to Barisan. Here then is the unfortunate irony: to kill Mahathir, first kill Lim Kit Siang and the DAP. The bogeyman dies. And, along with it, an insufferable DAP that got where it is today on the back of pontificating about ‘beyond race politics’, about nepotism and their holiness, about all for PAS, opportunistic sins, and on and on. The bogeyman dead, what political justification is there left for Malaiyoo Wan Saiful (and Bersatu) to be ‘Tuan‘? Answer, nothing.